Yay. I had somebody from Canada commenting on my dumplings video and he said he was able to make my dumplings from Robin Hood Special Blend Flour. You should give it a try 😉 Good luck with svickova. Yes it was the Robin Hood Special Blend. I know you made it with Wondra on Czech Cookbook and I googled the equivalent in Canada and there was a comment online that Robin Hood Special Blend Flour (It comes in a yellow ‘shifter’ can) is like Wondra (which also comes in a similar type can). Thank you again for your tip. I am sure it will be very helpful to lots of people. Now I just have to find out what is substitute for Wondra in UK. I have made Czech raised yeast dumplings in Canada for 30 years using unbleached all purpose flour and they are delicious! Use robinhood instant blending flour!!! I am not sure if you are telling me to use Robin Hood flour, which we definitely not have in USA. Thank you for the Svíčková recipe! I made it with the bread dumplings and it was sooo good 🙂 Awesome! It is a keeper. I love all the recipes I tried so far. They bring me right back to Czech Republic. Thank you very much! I forgot to tell you that I used Robin Hood nutri flour blend (“tastes like white”) available in Quebec. It worked great! Thank you for letting us know. It will surely help others in Canada. Thanks for the delicious goulash recipe. I am czech and my girlfriend is cuban. We live in miami. We invited her cuban parents over for dinner and made goulash with dumplings. Your directions were very easy to follow. Dinner was excellent and the Cubans were very impressed. Thank you Kristyna. 🙂 I am happy you all enjoyed it. Sounds yummy! There is so many different variations to any meal, but I don’t marinate the meat. Ahoi, svickova je nejlepsi:-) I send u warm greetings from germany, and i am very happy that i have found ur website. Thanks for ur work. Hi Dieter, thank you for your greetings. Many greetings back to Germany! I am glad you enjoy svickova. 🙂 Great Czech! Ahoj Kristyno! Vase svickova byla vynikajici! Dekuji za recept! Byl jsem loni v Brne, chtel jsem navstivit dum a muzeum Leose Janacka. Krasne mesto, a jeste krasnejsi byl nadherny moravsky venkov!! Thank you so much for the Svickova recipe. I just have one question for you. I am writing to you from Alberta Canada and I have celery root here. How much celery root would you use instead of the celery? I just stumbled on your website tonight and just have to say — I’m so excited to try your recipes. Thanks for making these videos. 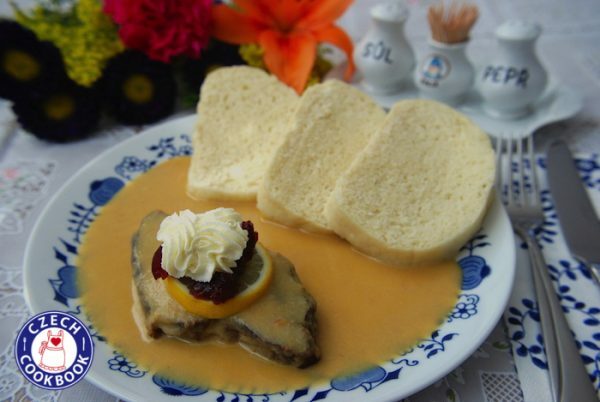 I fell in love with Czech food as a student in Prague years ago, and I’ve been eager to try making svíčková on my own. Thank you. Just do search here on my blog for dumplings. Or look at side dishes.